Bitcon was hit hard on September 5 with a $1000 fall in price over 24 hours. This move completely erased the bullish gains and have beaten the sentiment quite well. Though Bitcoin has shown signs of recovery from the hit the signs are rather weak. As such we may see Bitcoin move up to the resistance line at $6800 but the bulls will be unlikely to break the resistance and sustain the momentum. Bitcoin will need to move above $7500 and sustain for three days before we will consider long positions at this point. Further pullback to the support line that has held for Bitcoin since February this year is the likely course of action. 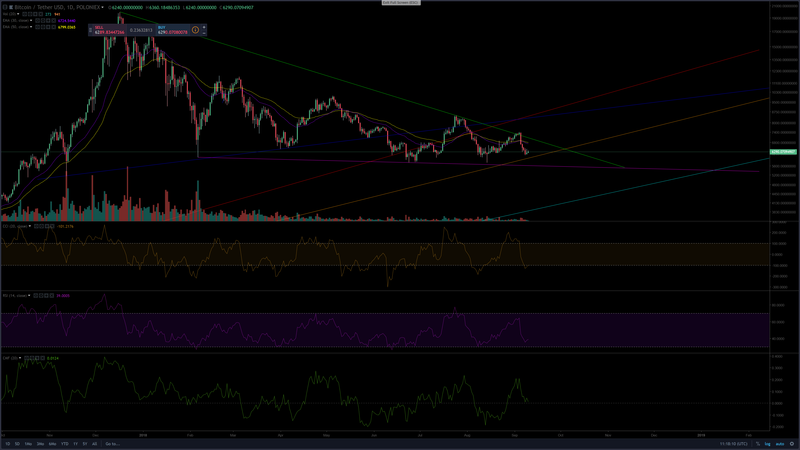 Currently, we see that support line at $5600 where Bitcion may wick to prices as low as $5400. This support line is critical for Bitcoin as it has been the most solid since reaching it's peak. With so many tests of this support there is concern that the real amount of support at this line is weak and that the bears could push through it. If so, the next major support line for Bitcoin is all the way down at $4200. Ether took a harder beating than most other cryptos during the Bitcoin slide. Ethereum broke below the support of the falling wedge but managed to find relief at $186. The current price level is important for several factors - Ethereum shorts are at an all time high which means a short squeeze could very well happen, this is the same support level region that Ethereum found in July 2017, and this is the yearly low for Ethereum. Even with all these factors the Risk/Reward for Ethereum is still not ideal. Though we will be looking to enter with a 50% the usual position at these prices and a stop-loss of $155. If Ethereum moves back above $235 we will likely commit out full position at that point. Ethereum may not break out but we could see a relief rally that could push the cryptocurrency as high as $295. 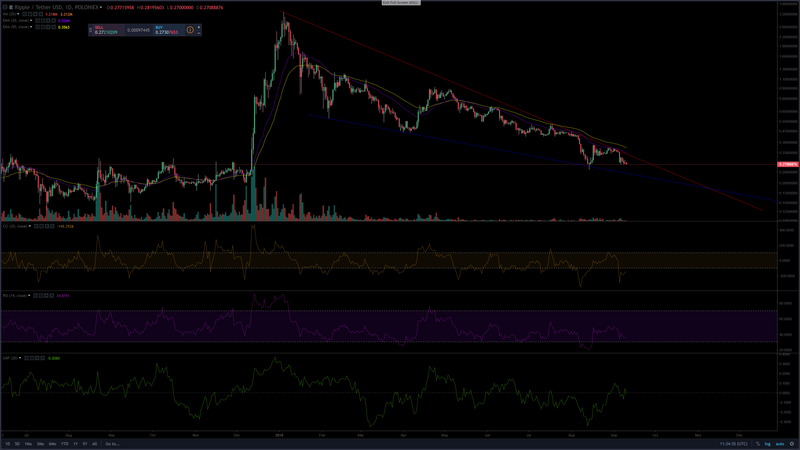 XRP continues to follow the falling wedge and has failed to break the resistance line at every attempt. XRP currently is priced near a previous strong level of support seen back on August 14. This time, the support is not expected to be as strong. 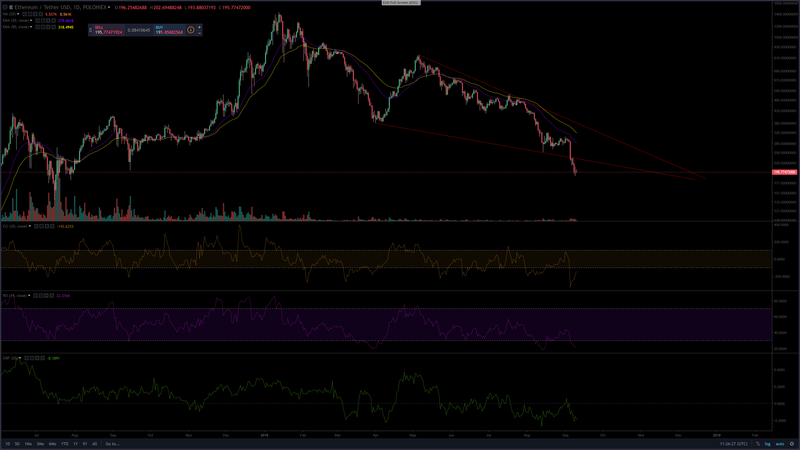 XRP will look to continue inside the falling wedge to/near completion over the next few weeks. If XRP is unable to break out of the wedge it is likely to see a capitulation dump that could see the price of XRP fall as low as $0.16 before rebounding. Traders looking for positions are advised to not take any in XRP at this time as the Risk/Reward is just not there. We will wait to see which way XRP decides to move before reevaluating for an entry position. If XRP capitulates and dumps below the support line it is expected that these prices will be bought by the bulls aggressively. On the upside XRP will need to break and sustain above $0.35 for three days before a trend reversal becomes likely enough for us to make an entry at higher prices.